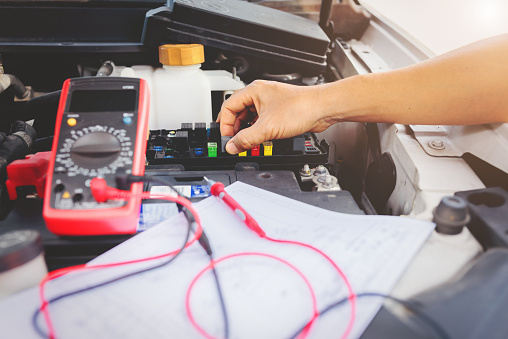 If your dashboard lights have recently lit up, you might be searching for car electrical repair in Azusa–in that case, Johnny’s Auto Repair can help. Located in convenient Covina, we serve the surrounding areas with our expert training and experience in all makes and models of cars, whether you drive a domestic car or a high-end foreign vehicle. Electrical problems can be overwhelming; it can be difficult to know whether you’re dealing with a minor repair or have a large-scale service issue. That’s why you need a mechanic you can trust. If you’ve recently searched the internet for an “auto electrical mechanic near me,” then search no further. Here’s how our extensive expertise can help you. Johnny’s Auto Service was founded in 1970. The current owner, Byron Moreira, has over 40 years of experience servicing automobiles. He expects no less than the highest qualifications and knowledge from his mechanics. When you enter our service area, clean, brightly lit bays will greet you. Whether you choose to spend your service time in our comfortable waiting area–with free Wi-Fi, TV, and complimentary beverages–or need to speak to one of our mechanics directly, you can be sure that your experience will be pleasant. Our service technicians are ASE-certified and accustomed to talking to clients in terms they can understand. We never try to upsell you on unnecessary repairs for your car electrical repair in Azusa. Instead, we will explain your issues in ways that you can understand, so that you’ll always be sure you’re getting car service you can trust, without needless extras. Searching for the right auto electrical mechanic near me can be daunting. Even with experience maintaining your own car, a car electrical repair in Azusa can require expert-level knowledge and training on the latest vehicles, computers, and technologies. That’s why it’s so important to find a mechanic you can trust. One visit to Johnny’s Auto Service in Covina will convince you to stop your search. We’re sure to have exactly what you’re looking for.